Epworth Allen was from Hunter’s Bar, Sheffield and was awarded the Military Medal in World War I. He lost a leg in 1917. 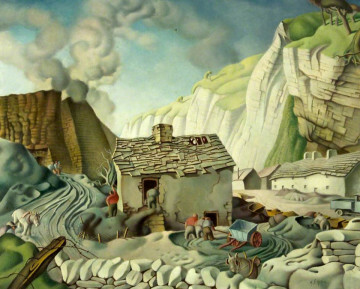 After the war he returned to the steel industry where he remained until he was made redundant in 1931, thereafter he relied upon his painting to support his living until his death in 1958. This painting is of The Dale, Stoney Middleton (listed on the BBC’s your paintings). Resident Lois Bekeris who has previously contributed to SMHCCG, recalls that her father Peter Hall who worked at Eyam Quarry used to tend the horses depicted in the foreground. The painting shows an early lime kiln opposite Lover’s Leap Café.